Posted June 9, 2004 in Articles and Quetico Park People. A few summers ago, Betty Powell Skoog returned to the homestead on Saganagons Lake in Quetico Park where she was born and spent the first fifteen years of her life. This beautiful site on the eastern end of the lake was home to three generations of Powells. During their half-century on Saganagons, five children were born and raised and three grandchildren also grew up here. One of these grandchildren, Betty Powell Skoog, wrote a marvelous book, A Life in Two Worlds, about her experiences on Saganagons Lake. This cabin was built by Betty and her sister Janette on the Powell homestead over fifty years ago. The book began as a way to make her memories about her childhood accessible to her children and grandchildren. She recorded her reminiscences on cassette tapes and eventually played some of them to Justine Kerfoot from Gunflint Lodge. Justine, a well-known author, had been a life-long friend of Betty’s mother Tempest Powell Benson. When Justine heard the tapes, she told Betty that her stories should be made available to a wider audience than just her own descendants. What began as a desire to pass on stories about her mother and grandparents to her offspring, grew into a fascinating book. Betty is justifiably proud of her heritage and her story isa remarkable tale of a unique family in a unique setting. The Powells were the last family to live year-around in what is now Quetico Park. They experienced Quetico as residents rather than as visitors. They lived off the land by combining the income from trapping and guiding with the food they grew in a large garden and the animals they killed for food. They traveled mainly by canoe during open water and by dog team during the winter. Only during the latter part of their stay on Saganagons in the 1950’s did they use outboard motors or snowmobiles to any extent. We sometimes forget that, until very recently,Quetico and the BWCAW were the home to the Ojibwa and to settlers in the early and mid 1900’s who lived among and with Ojibwa people. The Powells were contemporaries of Ottertrackís Benny Ambrose and Knife Lakeís Dorothy Molter. They were also distant neighbors to, among others, the Kerfoots, Plummers and Cooks on Gunflint Lake and the Madsens and Richardsons on Saganaga. It is ironic that, in order to maintain the shrinking natural environment that supported Native People for thousands of years and attracted settlers such as Jack Powell, the governments of Canada and the United States had to create wilderness areas where human activities are restricted. Betty Powell Skoog is the last of those who knew Quetico Park as home rather than merely as a canoeist or park employee. This article concentrates on Betty Powellís memories of those activities that were necessary for the Powells to live as permanent residents in what is now part of Quetico Park. When the Powells lived on Saganagons, the entire eastern half of the lake was outside of Quetico. It was not until 1979 that the Park boundary was extended to include all of Saganagons Lake. The Powells hadnít been living on Saganagons for twenty years when this expansion, which made their homestead part of Quetico Park, occurred. During their time on the lake, they trapped and guided in order to obtain enough money to buy necessary supplies but obtained most of their food from the land. They hunted moose and deer, snared snowshoe hare and partridge, had a large garden and a variety of domesticated animals, and gathered medicinal plants. They lived a lifestyle that was an interesting blending of the very different cultures and backgrounds of Mary Ottertail and Jack Powell. In 1901, Jack Powell and Aquayweasheik (Mary Ottertail) were married on Basswood Lake. A few years later they moved to the east end of Saganagons Lake where they built a cabin and settled down. Aquayweasheik was Ojibwa and grew up on the Lac La Croix Reserve. Relatively little is known about Jack Powell other than he evidently was of Irish and English descent and came from Michigan. He worked at a variety of jobs in northern Minnesota and met Aquayweasheik while he was working at a logging camp on Basswood Lake. Betty remembers her Grandmother speaking Ojibwa and her Grandfather always speaking in English. Only after she left Saganagons did she realize that other families communicated in just one language rather than two. The Powells had five children; Mike, Esther, Frank, William and Tempest. All were born on Saganagons except Frank, who was born in a trappers cabin when his parents were on their way to Winton, Minnesota to get supplies. Jack Powell and his son Mike were employed as Quetico Park rangers in 1917 and in the early 1920’s worked as fire rangers in Quetico. The Powell family lived year around on Saganagons until they moved to Saganaga in 1954. Tempest, their youngest child, always loved being in the woods and became a guide on Saganaga and surrounding lakes in the summer and a trapper in the winter. She had three daughters who grew up as part of the Powell extended family on Saganagons. Tempest lived on Saganagons until 1950 when she married Irv Benson and moved to Saganaga. She would then take the two-and-a -half-mile portage from Saganaga to Saganagons almost daily so she could spend time with her children and her parents. Betty recalls her mother guiding and carrying big square-stern canoes and often wondered what people thought when she threw a canoe on her shoulders and took it across a portage, or skinned and gutted a moose, or stretched a beaver, mink or otter skin. She remembers one of the men her mother guided saying ‘that woman could hold her own with any man’. When Ken Skoog went with Betty to Saganagons to meet her mother and grandparents, he was impressed with the ability of the Powell women to trap, hunt, fish, drive a dog team and generally do whatever was required to survive in the woods. He called them the ‘all-around women’ from Saganagons. The tradition of leaving items unlocked, common in isolated areas, continued until recently on an island on the west end of Saganaga called Red Tank Island. For many decades when they found themselves low on gas on the west end of the lake, Saganaga residents would refill their gas tanks from a large red tank and then replenish the tank the next time they went down the lake. This continued for decades until tourists simply obtained free gas and never bothered to re-fill the tank. When we arrived as Quetico Ranger on Saganaga in 1980, this long-standing tradition had recently been abandoned. The Powellís were very self-sufficient and only went to town twice a year for groceries. This usually meant a trip by canoe or dog team to Winton, Minnesota. This was a treat for Tempest since she then had an opportunity to play with Esther Ahonen, a girl her age in Winton. Although many miles and numerous portages were involved, up until the mid-1940’s, traveling to Winton to sell their furs and get groceries was the easiest option. When a gravel road was built north of the border from Fort William to the west, it became easier to take the furs out to a trading post known as McKechnies Mill. To get there they still had a long paddle down through Gunflint Lake east along the border to Rose Lake and north to the road. Once there, they could take a bus to Fort William. In town, they bought rice, flour, sugar, tea, salt and sometimes got some butter or lard. Usually, however, sufficient lard was obtained by rendering bear fat and using that on bannock. They also got kerosene for lamps and batteries for the radio. To conserve batteries, the radio was used sparingly, mainly to listen to the news in order to find out what was going on in the world. The kerosene was used for light, but its use was rationed, and they primarily went to bed and got up based on the sun. Instead of hauling in expensive, heavy roofing paper from Winton, they used birchbark on the roofs. Jack Powell also would cut hay every fall to replenish the mattresses. Many of their clothes were made by Grandma Powell on a treadle sewing machine. She made moccasins, jackets, and parkas from moose hide and other items from cloth bought in Winton. She also made rabbit skin blankets and boot liners from rabbit skins. Most of their camping equipment, such as tents and sleeping robes, was also homemade. They had a large garden and they grew potatoes, carrots, rutabagas and cabbage. They also planted potatoes on the islands in Saganagons that had sufficient soil. Jack Powell, the main gardener in the family, called this his ‘wilderness farm. ‘These crops were stored in a root cellar under the main cabin. In the spring they collected birch sap and drank this as long as it lasted. They also picked and dried a large number of blueberries every fall and once every two years they made a trip to Whitefish Lake to gather wild rice. They would get together with the Plummers and the Cooks, who lived on Gunflint Lake, and travel with them east along the border and then north to Whitefish Lake. These trips combined practical food gathering with an opportunity to get together with families on Gunflint Lake. To complete their ‘farm’, they also had chickens and a goat. For a few years they even had a cow and a bull which they brought to Saganagons from Winton. As you can imagine, getting a cow and a bull, as well as the raft they rode on, over the numerous portages was an incredible feat that is described in Bettyís book. Their principal food was snowshoe hare and partridge. Betty and her sisters had rabbit snare lines that they would check daily. Consequently, much of the meat was snared in the vicinity of their home. They supplemented this with deer or moose which was usually shot by Grandma Powell. They only shot what they needed for food. Grandma Powell always insisted that animals could only be killed for a reason and if something was killed it had to be eaten. Betty said that when she was young she once shot a loon and her Grandmother made her boil it and eat it. She found out that loon is very unsavory and a valuable lesson was learned. Betty had two younger sisters: Janette was three years younger and Minerva was born when Betty was nine years old. Since Janette was closest in age, they were constant companions who played games, set snares, trapped beaver and, when Betty was just twelve, built a log cabin together. Neither Betty nor her sisters had any formal schooling other than a few government correspondence courses that her grandfather, who had only a third grade education, administered to them. They were fortunate, especially considering the negative experiences that other Native students had, that they avoided being sent to boarding school. They made up for the lack of formal education by learning daily the myriad skills required to live in the woods. Both grandparents were skilled storytellers and Grandma Powell was especially insistent on their learning about the spiritual values of her ancestors. Betty remembers that there was often music in their house. Grandpa Powell liked to sing and also played the ‘bones’. Her Uncle Mike played the banjo, Uncle Frank the fiddle, her sister Janette the mandolin and Tempest played the butterbox accordion. During the summer of 1997, an archaeological survey of the area burned in the big 1995 fire was carried out. This burned area included almost the entire north shore of Saganagons Lake. Since we were close to the Powell homestead we went over to take a look at that area even though it was outside of the burn area. I was with Frank Jordan from Lac La Croix, and since he was a distant relative of Mary Ottertail, this stop was of special interest to him. We landed on a small sand beach and at the back of the beach was a trail that led to log cabin. 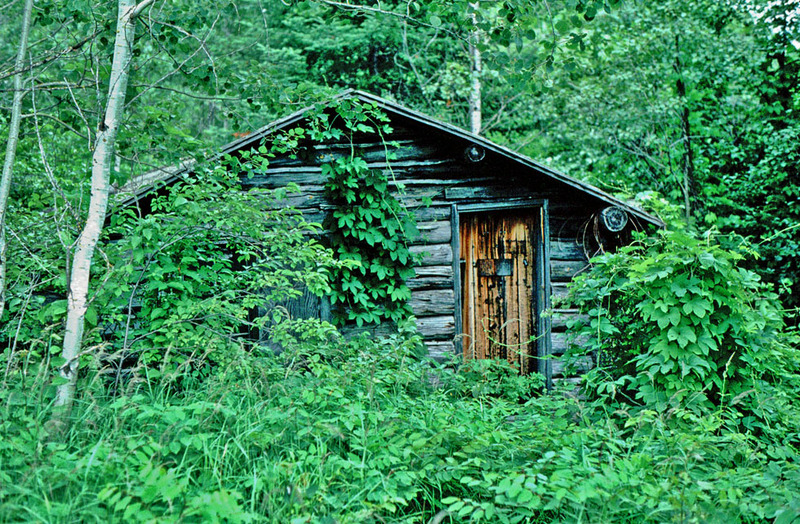 This cabin, built by Betty and Janette when Betty was just twelve, was now covered with Virginia creeper vines and looked serene but vulnerable. After the Powells left Saganagons, it had been used as a trapper cabin by Tempestís husband Irv Benson but had stood empty for the last few years. I was impressed that the trail, apparently taken by a large number of canoeists, stopped just short of the cabin door. People had obviously respected the privacy of the cabin owners and hadnít entered or done any apparent damage. The main cabin, no longer standing, was located a few hundred metres to the north in what is now an open grassy field, but the outline of the cabin foundation was still visible. A large flat, grassy area was probably the location of the large garden. Robust rose bushes that stood about five feet tall grew at the back of the clearing. It was strange to imagine that a cow and a bull, chickens and goats once lived in this clearing. Three generations of memories linger at the Powell ‘wilderness farm’. Two summers later, Betty and her husband Ken Skoog returned to the Powell homestead. They noticed on the paddle from Saganaga to Saganagons that many landmarks were hard to recognize after the fire. The beach seemed smaller than it used to be and the high hill behind the cabin, where Janette and Betty used to watch for approaching visitors, seemed to have shrunk. She noticed that the grapes her grandparents had planted were now growing wild. The tiger lilies she remembered so distinctly from her childhood were also growing wild. Since these flowers reminded her of Saganagons, Betty always had tiger lilies at her homes after leaving Saganagons and has them now at her home near Silver Bay. Mr. Nelson I found about my relatives this evening in this wonderful article you have written about the Powell family. Thank you so much. hi,jon nelson,thanks for the awesome article you wrote on the powells. Wishing you and the powells all the best!!! I am trying to learn about my family history. I stumbled on this article while I was searching for something about my grandfather. I think I may be very very very distantly related to these Powells. Lt. Governor Adolphus Frederick Hubbard of Illinois had a daughter named Margaret who was an honorary member of a local native American tribe (Chickasaw or Shawnee, not sure which) and she married Richard Sterling Powell who was my great grandfather. Do any of those names mean anything to you…or the names Randolph or Lombard? Hi! Thank you for this thrilling and endearing story. I enjoyed reading and learning about the Powell family, their homestead on Saganagons Lake and living of their beloved land. Happy to hear the story about the beavers and their dam. Smiles to all from Ontario, Canada.! Great to read about my great great grandparents!!! Am helping a descendant of George Plummer and Mary Netowance Plummer to unravel ancestry and learn history of the Plummer family. Descendant’s grandmother was Glsdys Plummer. We know Plummers lived on Canadian dide of Gunflint Lake. Enjoyed very much reading your article, and would also appreciate very much any information you may have or wish to share about the Plummer family. This is a fascinating article to me as my father took me, my brother and brother in law to Saganagons fishing in mid to late “70’s. We were picked up by Frank Powell, I believe, and traveled to his house on Saganaga and portaged to Saganagons and stayed a week in one of the cabins there (at least I remember there being 2 cabins). My brother and I are planning a return trip next summer with our families and we were looking at maps and trying to recall where Frank picked us up, how long the portage was etc. My memory was approx 2 miles and this story says 2-1/2 mile portage. Is this the same portage we took possibly? Where is the cabin Betty and her sister built in relation to where the cabin we stayed in, located? Those were wonderful memories. Easy to romanticize what must have been a hard yet wonderful life.